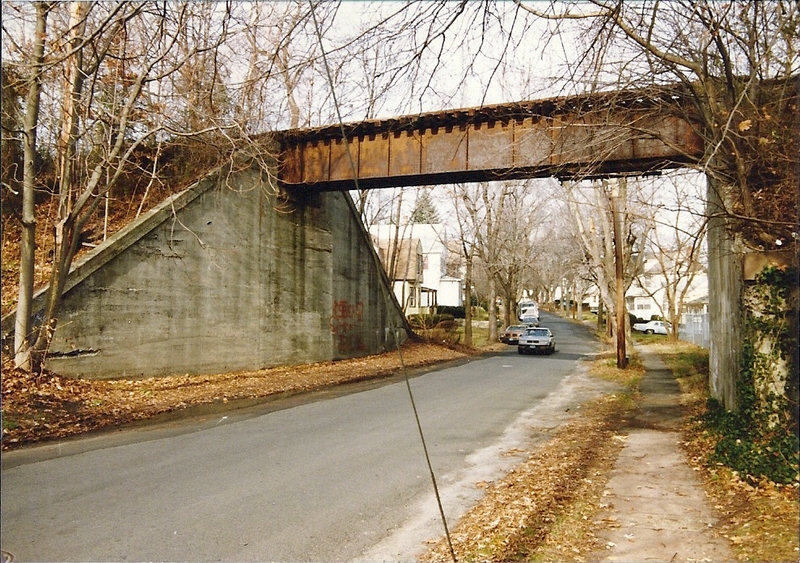 The Russell Place bridge as it appeared c.1990, trains had not run through this portion since c.1976. At 20'-9" high, this bridge measured the highest of all the RV bridges. Photo taken by Jeff Jargosch. Over Russell Place. One span deck plate girder bridge for one track. Girders 50'-0" long. Underclearance 20'-9". Condition fair. No repairs. Nicholas C. J. English, General Counsel for the railroad, negotiated with the City of Summit to acquire the proper permits. It is unclear whether entirely new bridges were constructed or the original ones, which were pulled down, were utilized. Curiously, the concrete abutments are stamped "1915." Although the bridge has not seen a train since the formation of Conrail in 1976, it still remains in place. 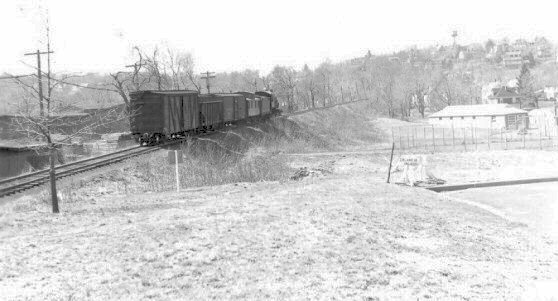 #13, Caboose #102, and a cut of cars roll along the elevated RV mainline through Summit in this 1948 view. #13 is crossing Russell Place. Stephens-Miller, an RV customer, can be seen to the left.